Posted on May 27, 2015 by Barry V.
There’s a sweet spot in the Hickory/Hornbeam woods on the back side of Brown Hill at Wachusett Meadow Wildlife Sanctuary. Joe Choiniere tipped me off to this rocky slope where Hepatica, Dutchman’s Breeches, Early Saxifrage and Small-flowered Crowfoot can be found. 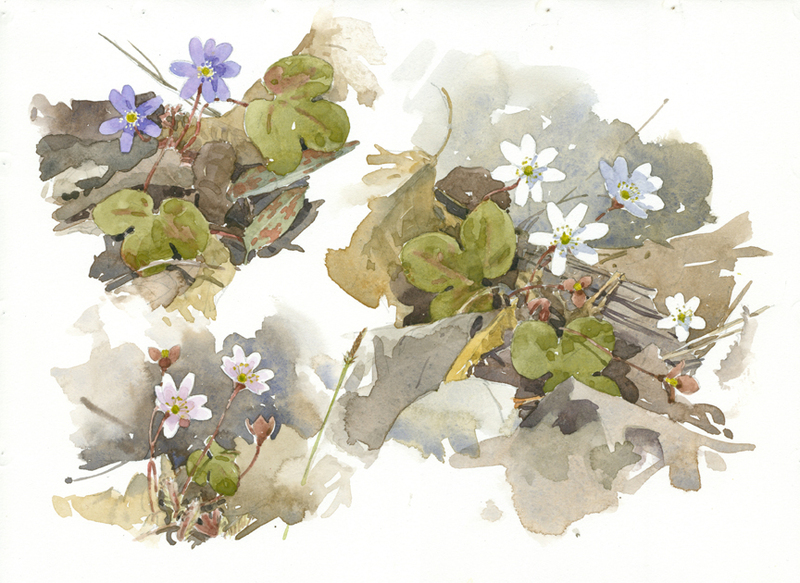 Today, with the help of some marker flags placed by Joe, I found the lovely Hepaticas in full bloom. The blossoms varied from white to pale pink to a lovely sky blue. I set up my field kit and made a painting showing the three color variations. You can see a few trout lily leaves in the upper left of my watercolor – these handsome, mottled leaves were poking up all over the forest floor. 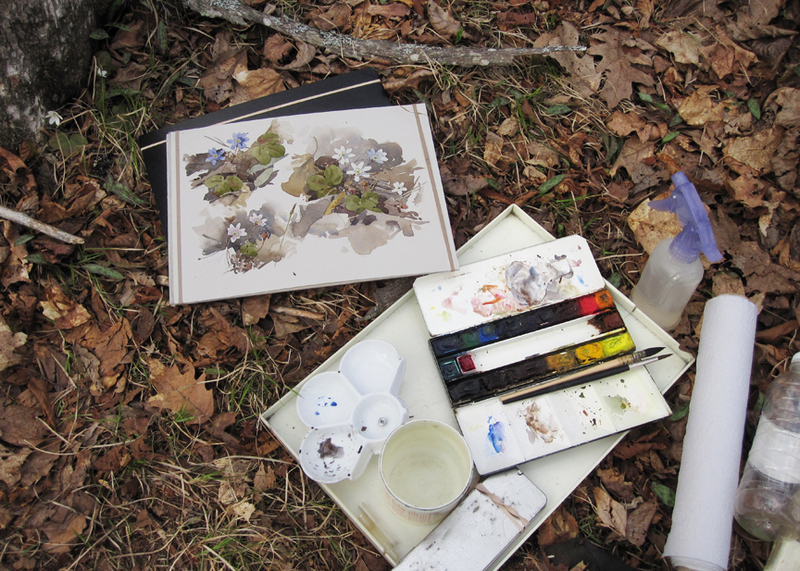 In this photo of my painting set-up you can just see a few of the Hepatica blossoms in the upper left corner. They are truly small flowers. While I worked, yellow-rumped warblers murmured from the trees overhead and a sapsucker sounded off periodically. By about 4:30 pm the blossoms started to nod and close up for the night. I did another drawing of the nodding blossoms, and added color back in the studio. 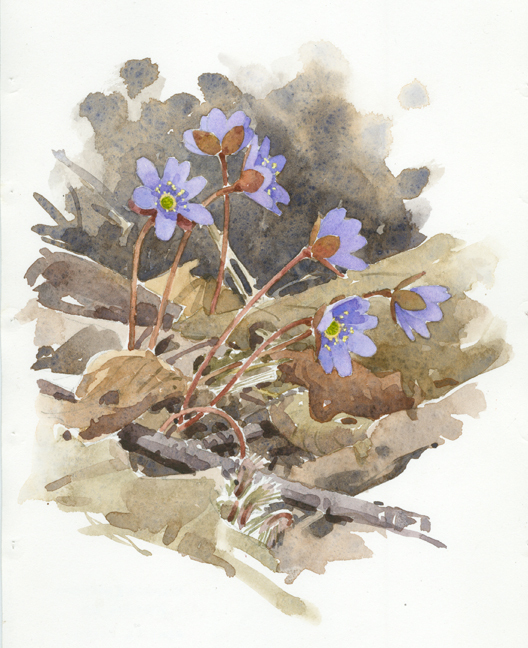 This entry was posted in Artists, Barry Van Dusen Residency, Natural History, News, Wildlife Sanctuary and tagged Barry Van Dusen, botany, hepatica, Mount Wachusett, Natural History, Sketching, Watercolors on May 27, 2015 by Barry V..